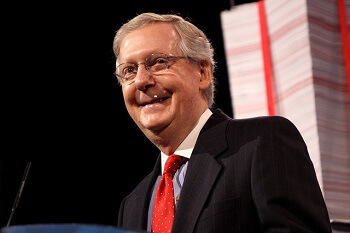 Since the ACA's 2010 initiation, Sen. Mitch McConnell of Kentucky has been a driving force behind the GOP Senate's Obamacare repeal process. Yesterday, the Republican-controlled Senate voted to repeal Obamacare – President Barack Obama's signature healthcare law – in a 52 to 47 vote. This was the 62nd time the Senate has cast a ballot to repeal all or part of the 2010 statute. If the House sends the Senate's bill to President Obama as expected, the measure will become the first of its kind to reach the president – an act Republicans have said will highlight GOP priorities for voters. The Affordable Care Act repeal is being hailed as a victory – even if just a small one. Looking to make good on their campaign pledges to "repeal and replace" Obamacare, freshly elected House Republicans managed to get a measure scrapping the law to the House floor almost immediately – and in the form of a bill (H.R.2) that would "repeal the job-killing healthcare law." It ultimately failed in the Senate because there was no mention of a replacement in the terse bill. The House voted to repeal the 1099 ACA reporting requirement for small businesses – a provision intended to generate $22 billion for the law. It passed, but the repeal did not affect the fundamental structure of the ACA. The House voted to include Social Security benefits when calculating the modified adjusted gross income to determine eligibility for financial assistance, making it more difficult for some people to access care.